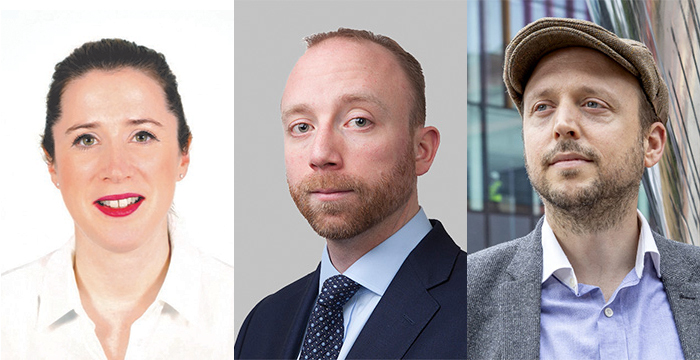 Three big names from the world of legal tech and innovation have been announced today for Legal Cheek’s Future of Legal Education and Training Conference 2019. Dani McCormick, director of solutions at global legal resource company LexisNexis, will feature during the headline morning session on cross-disciplinary skills and the coming together, in particular, of law and computer science. McCormick, a former commercial litigator, leads Lexis Draft, a legal document drafting tool designed to increase lawyer productivity. She will compare insights with Jeremy Coleman, innovation manager at Norton Rose Fulbright (NRF) for Europe, the Middle East and Asia (EMEA). McCormick and Coleman will be joined by Dr John Haskell, a senior lecturer in law at the University of Manchester. Revealed exclusively by Legal Cheek in June, Haskell will discuss the university’s law and computer science departments partnership with magic circle firm Freshfields to launch a lawtech module as part of its undergraduate curriculum. Today’s speaker announcement comes as university law faculties across the country use the upcoming Solicitors Qualifying Examination (SQE), which will replace the Legal Practice Course (LPC), as an opportunity to modernise their course offerings. The cross-disciplinary skills session also has an innovation theme and will aim to answer the question: should undergraduate law degrees be more focused on preparing students for practice? It will be chaired by head of development (innovation technology) at BPP University Law School, Adam Curphey, who will also lead the session’s interactive design thinking activity and audience discussion. The former White & Case lawyer will be joined by Jonathan Kewley, the co-head of Clifford Chance’s tech practice and one of the leading figures behind the firm’s new IGNITE lawtech training contract and Freshfields chief legal innovation officer Isabel Parker, who will offer her perspective on the firm’s tie-up with Manchester Uni. Another central topic at the Conference — which takes place on 22 May at Kings Place London and is supported by lead sponsors BPP University Law School and The University of Law — will be the practical effects of the new SQE featuring Solicitors Regulation Authority education and training chief Julie Brannan. We’ll also be hearing three opening TED-style talks on the topic of entrepreneurialism and how it can be embedded to a greater extent in legal education and training. Other sessions will focus on education and training at the bar, clinical legal education and mental health, wellbeing and resilience. The full schedule, including a list of speakers announced so far, can be found here. LexisNexis will be exhibiting as one of the silver sponsors during the day-long Conference, alongside our other silver sponsor Nottingham Law School. First release tickets are available to purchase until midnight on Wednesday 17 April. General release tickets at full price will be available from 18 April. Sounds riveting. Reminds me of my US army days! Who is actually going to this conference as an attendee? Does anyone know of anyone who has bought a ticket? I went last year – it was really good. Good discussion and pretty much all of the big law firms were there (so great networking opp).